An international campaign, organised by Piero Sraffa at Cambridge University and Gramsci's sister-in-law Tatiana, was mounted to demand Gramsci's release. 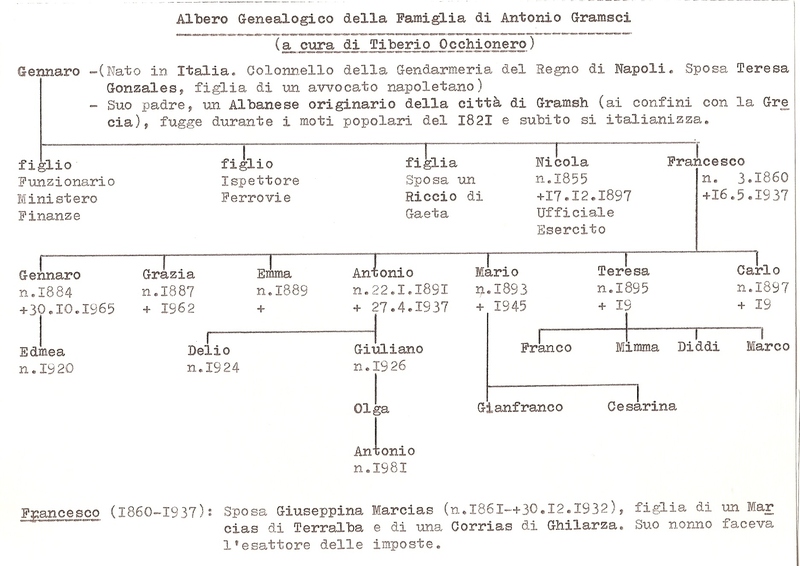 In 1933 he was moved from the prison at Turi to a clinic at Formia, but was still being denied adequate medical attention. Two years later he was moved to the "Quisisana" clinic in Rome. He was due for release on 21 April 1937 and planned to retire to Sardinia for convalescence, but a combination of arteriosclerosis, pulmonary tuberculosis, high blood pressure, angina, gout and acute gastric disorders meant that he was too ill to move. 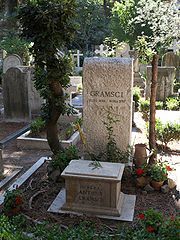 Gramsci died on 27 April 1937, at the age of 46. His ashes are buried in the Cimitero Acattolico (Non-Catholic Cemetery) in Rome. A critique of pre-Marxist philosophical materialism. 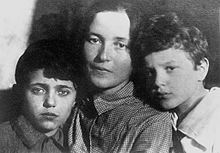 To counter the notion that bourgeois values represented "natural" or "normal" values for society, the working class needed to develop a culture of its own. Lenin held that culture was "ancillary" to political objectives, but for Gramsci it was fundamental to the attainment of power that cultural hegemony be achieved first. In Gramsci's view, a class cannot dominate in modern conditions by merely advancing its own narrow economic interests; neither can it dominate purely through force and coercion. Rather, it must exert intellectual and moral leadership, and make alliances and compromises with a variety of forces. Gramsci calls this union of social forces a "historic bloc", taking a term from Georges Sorel. This bloc forms the basis of consent to a certain social order, which produces and re-produces the hegemony of the dominant class through a nexus of institutions, social relations, and ideas. In this way, Gramsci's theory emphasized the importance of the political and ideological superstructure in both maintaining and fracturing relations of the economic base. Gramsci gave much thought to the role of intellectuals in society. Famously, he stated that all men are intellectuals, in that all have intellectual and rational faculties, but not all men have the social function of intellectuals. He saw modern intellectuals not as talkers, but as practically-minded directors and organisers who produced hegemony through ideological apparatuses such as education and the media. Furthermore, he distinguished between a "traditional" intelligentsia which sees itself (wrongly) as a class apart from society, and the thinking groups which every class produces from its own ranks "organically". Such "organic" intellectuals do not simply describe social life in accordance with scientific rules, but instead articulate, through the language of culture, the feelings and experiences which the masses could not express for themselves. To Gramsci, it was the duty of organic intellectuals to speak to the obscured precepts of folk wisdom, or common sense (senso comune), of their respective politic spheres. These intellectuals would represent excluded social groups of a society, what Gramsci referred to as the subaltern. Gramsci's theory of hegemony is tied to his conception of the capitalist state. Gramsci does not understand the 'state' in the narrow sense of the government. Instead, he divides it between 'political society' (the police, the army, legal system, etc.) – the arena of political institutions and legal constitutional control – and 'civil society' (the family, the education system, trade unions, etc.) – commonly seen as the 'private' or 'non-state' sphere, mediating between the state and the economy. However, he stresses that the division is purely conceptual and that the two often overlap in reality. Gramsci claims the capitalist state rules through force plus consent: political society is the realm of force and civil society is the realm of consent. Gramsci proffers that under modern capitalism the bourgeoisie can maintain its economic control by allowing certain demands made by trade unions and mass political parties within civil society to be met by the political sphere. Thus, the bourgeoisie engages in passive revolution by going beyond its immediate economic interests and allowing the forms of its hegemony to change. Gramsci posits that movements such as reformism and fascism, as well as the 'scientific management' and assembly line methods of Frederick Taylor and Henry Ford, respectively, are examples of this. Drawing from Machiavelli, he argues that 'The Modern Prince' – the revolutionary party – is the force that will allow the working-class to develop organic intellectuals and an alternative hegemony within civil society. 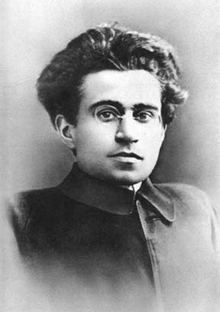 For Gramsci, the complex nature of modern civil society means that a 'war of position', carried out by revolutionaries through political agitation, the trade unions, advancement of proletarian culture, and other ways to create an opposing civil society was necessary alongside a 'war of manoeuvre' – a direct revolution – in order to have a successful revolution without a danger of a counter-revolution or degeneration. Gramsci, like the early Marx, was an emphatic proponent of historicism. In Gramsci's view, all meaning derives from the relation between human practical activity (or "praxis") and the "objective" historical and social processes of which it is a part. Ideas cannot be understood outside their social and historical context, apart from their function and origin. The concepts by which we organise our knowledge of the world do not derive primarily from our relation to things (to an objective reality), but rather from the social relations (economic, for Marx) between the bearers of those concepts. As a result, there is no such thing as an unchanging "human nature". Furthermore, philosophy and science do not "reflect" a reality independent of man. Rather, a theory can be said to be "true" when, in any given historical situation, it expresses the real developmental trend of that situation. For the majority of Marxists, truth was truth no matter when and where it is known, and scientific knowledge (which included Marxism) accumulated historically as the advance of truth in this everyday sense. In this view, Marxism (or the Marxist theory of history and economics) did not belong to the illusory realm of the superstructure because it is a science. In contrast, Gramsci believed Marxism was "true" in a socially pragmatic sense: by articulating the class consciousness of the proletariat, Marxism expressed the "truth" of its times better than any other theory. This anti-scientistic and anti-positivist stance was indebted to the influence of Benedetto Croce. However, it should be underlined that Gramsci's "absolute historicism" broke with Croce's tendency to secure a metaphysical synthesis in historical "destiny". Though Gramsci repudiates the charge, his historical account of truth has been criticised as a form of relativism. 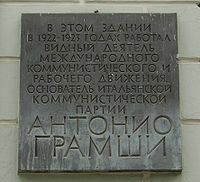 In a notable pre-prison article entitled "The Revolution against Das Kapital", Gramsci wrote that the October Revolution in Russia had invalidated the idea that socialist revolution had to await the full development of capitalist forces of production. This reflected his view that Marxism was not a determinist philosophy. The principle of the causal "primacy" of the forces of production was a misconception of Marxism. Both economic changes and cultural changes are expressions of a "basic historical process", and it is difficult to say which sphere has primacy over the other. The belief from the earliest years of the workers' movement that it would inevitably triumph due to "historical laws" was a product of the historical circumstances of an oppressed class restricted mainly to defensive action. This fatalistic doctrine was to be abandoned as a hindrance once the working-class became able to take the initiative. Because Marxism is a "philosophy of praxis", it cannot rely on unseen "historical laws" as the agents of social change. History is defined by human praxis and therefore includes human will. Nonetheless, will-power cannot achieve anything it likes in any given situation: when the consciousness of the working-class reaches the stage of development necessary for action, it will encounter historical circumstances that cannot be arbitrarily altered. However, it is not predetermined by historical inevitability or "destiny" as to which of several possible developments will take place as a result. His critique of economism also extended to that practised by the syndicalists of the Italian trade unions. He believed that many trade unionists had settled for a reformist, gradualist approach in that they had refused to struggle on the political front in addition to the economic front. For Gramsci, much as the ruling class can look beyond its own immediate economic interests to reorganise the forms of its own hegemony, so must the working-class present its own interests as congruous with the universal advancement of society. While Gramsci envisioned the trade unions as one organ of a counter-hegemonic force in capitalist society, the trade union leaders simply saw these organizations as a means to improve conditions within the existing structure. Gramsci referred to the views of these trade unionists as "vulgar economism", which he equated to covert reformism and even liberalism. By virtue of his belief that human history and collective praxis determine whether any philosophical question is meaningful or not, Gramsci's views run contrary to the metaphysical materialism and 'copy' theory of perception advanced by Engels and Lenin, though he does not explicitly state this. For Gramsci, Marxism does not deal with a reality that exists in and for itself, independent of humanity. The concept of an objective universe outside of human history and human praxis was analogous to belief in God. Gramsci defined objectivity in terms of a universal intersubjectivity to be established in a future communist society. Natural history was thus only meaningful in relation to human history. In his view philosophical materialism resulted from a lack of critical thought, and could not be said to oppose religious dogma and superstition. Despite this, Gramsci resigned himself to the existence of this arguably cruder form of Marxism. Marxism was a philosophy for the proletariat, a subaltern class, and thus could often only be expressed in the form of popular superstition and common sense. Nonetheless, it was necessary to effectively challenge the ideologies of the educated classes, and to do so Marxists must present their philosophy in a more sophisticated guise, and attempt to genuinely understand their opponents’ views.